I was hoping that 100% Love would be closer to the Sukumar of Arya 2 (one of my favourite films) than of Jagadam (not a favourite). It wasn’t quite up to that high standard but I still found lots to enjoy including one of the more likeable heroine roles I’ve seen recently. Chaitanya, son of legend Nagarjuna, is Balu. Balu is a top student, and seems to get his results by bullying the rest of his household into following a routine that works for him. He is arrogant, emotionally immature and sulky. He sneaks cigarettes, berates his fellow students (I can’t really call them his friends) and his world revolves around himself. His cousin Mahalakshmi (Tamannah) comes to stay at the family home and goes to the same college. Initially just a scatterbrained teenage girl she struggles with classes and with her new domestic routine. She has a crush on Balu and doesn’t trouble to hide it from him. Over the first half of the film, Mahalakshmi adopts a punishing study regime imposed by Balu and grows in confidence and ability. The pair become rivals for the top spot, and collude to stop Ajit (Anand) from stealing Balu’s number one ranking. The plotting and scheming means they grow closer. Their feelings are obvious – or is it just an infatuation that will pass? The question of infatuation versus love is raised over and over, and both characters grapple with the change in their relationship. Mahalakshmi loves her cousin but she has to adjust to his demanding personality, while he seems to be taken aback by his rebellious hormones. Balu dismisses her as a little girl with a crush and doesn’t take his own feelings towards Maha seriously either. Balu cannot deal with anyone outdoing him, and needs constant reassurance that he and only he is the greatest. When Mahalakshmi fails to give him the adulation he wants, and even worse shows admiration for Ajit, he demands that she leave his family home. Post interval, the story shifts to what happens after this rift. Will they get back together or each marry a new partner? Will Balu ever grow up? Things get complicated, and the story gets a little more dramatic but this never strays very far from standard rom-com territory. Balu is one dimensional for much of the film, but Chaitanya manages to be appealing, adding small flourishes that make Balu more human. However Balu is so self-centred and joyless that the more light hearted moments don’t always fit. Style wise he is a sharp dressed young man which at first seemed at odds with the character, but as a typical overachiever he dedicates himself to also being top ranked with the ladies. Chaitanya’s performance develops more texture as the relationship with Mahalakshmi also deepens and Balu’s emotional range broadens. When the pair have to work together to avert a crisis, Balu falls back into his childish behaviour and it is up to Mahalakshmi to shake some sense into him. Chaitanya worked hard to make foolish Balu more sympathetic in the second half of the story with flickers of facial expression, subtle reactions and changes in the way he looked at his cousin. He seems to lack the physical confidence to really dominate the dance and fight sequences so those scenes were adequate but not noteworthy. For some unknown reason there was a huge cheer in the theatre every time he lit up a cigarette. Strange! Tamanna is excellent. She captured the energy and body language of the young girl and showed maturity and confidence as time passed and Mahalakshmi became a young woman. Unlike the boys in the theatre I was a bit tired of seeing her navel, but she did look beautiful. And the belly button scenes weren’t sleazy voyeuristic shots, but often formed part of Maha’s plan to unsettle Balu so were played quite knowingly. Initially Maha’s mannerisms were irritating and affected but those decreased as she grew up, adapted to college and found her feet. Her portrayal of love for Balu was convincing and the dramatic scenes were high on emotion but not overdone. She was full of light hearted happiness in the beginning, so when things went off the rails there was more contrast for Tamanna to work with and she excelled. I’ve only seen her in a couple of films and was really impressed by this performance. The comedy is mostly integral to the story and so occasionally it is even amusing. 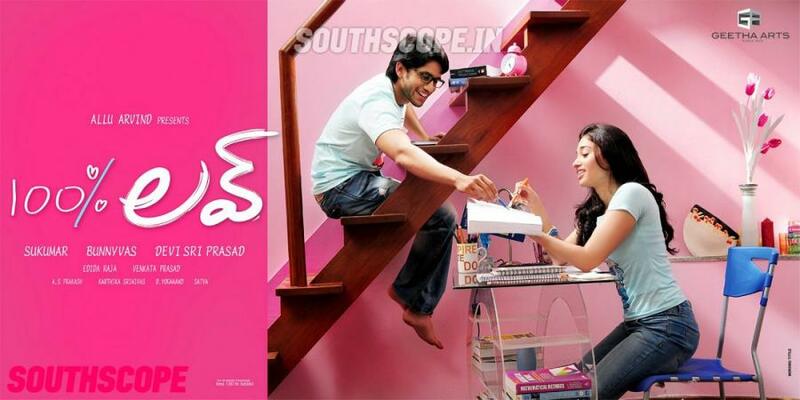 Chaitanya and Tamannah had nice timing and they bounced dialogue back and forth with great pace and energy. The audience laughed uproariously throughout some speeches. Comedy uncle (Dharmavarapu Subramanyam) is instantly recognisable by his terrible wig, and MS Narayan heads the college. There are running jokes throughout the film – if you can’t stand the sight of fried chicken this is not the film for you! Another running gag is a funny yet bittersweet Shah Rukh/Kajol joke. There are also six wisecracking kids learning to be geniuses from Balu. They aren’t terrible but I’m not a fan of the cutesy child artists for the most part. It takes an exceptional child actor, probably only Master Titoo in his purple ruffly outfit accessorised with Shashi Kapoor, to make me not long for the DVD fast forward. The supporting cast seemed fine, but I gave them minimum attention as I was concentrating on the dialogue heavy main story. The visual effects are frequently clumsy so I did find them underwhelming. The songs range from average (Aho Balu) to quirky (A Squared) to excellent (Diyalo Diyala) and Devi Sri Prasad matches the mood and characters well. The choreography is limited for both the leads, with no long shots or protracted sequences. Chaitanya looked like he was concentrating very hard on some steps but he didn’t hold back. Maybe he should book a stint at Bunny Boot Camp before the next film? The ANR and NTR tribute song was short but fun. The execution of the dance steps could have been a little more polished, but Tamanna always looked like she was having a great time. The songs generally fit the story, apart from Diyalo Diyala which I think had the story written to fit it but that was such a good call. I enjoyed 100% Love more than I expected to. Tamannah stole the show so if you want to see a light romantic comedy with an engaging heroine, this might be just the ticket. This entry was posted in Tollywood and tagged 100% Love, Adventures without subtitles, Anand, Chaitanya, Devi Sri Prasad, Dharmavarapu Subrahmanyam, Sukumar, Tamanna, Telugu, Tollywood. Bookmark the permalink. I liked this movie but wished for it to be better. I agree with you that Chaitu worked hard to make Balu lovable and believable.